It’s easy to get overwhelmed with the gazillion apps available on the interwebs, so here at Magnoliahouse HQ, we like to keep things pretty simple. We have a strict policy that if it doesn’t make life easier, it’s out the door. To that end, we use exactly four apps to manage our social media on a daily basis. Like every visual person, we’re totally compulsive about our Instagram feeds, which used to mean lots of trial and error. Post a photo that doesn’t fit quite right? Delete it and try again. Planoly (formerly Planogr.am) takes the guesswork out of the process by letting you upload, rearrange and preview how photos will look in your feed before you post. In addition, their interface lets you upload images from your computer and type the captions using all ten of your fingers on a real keyboard – rather than looking like an elderly person picking away at your smartphone. Amen! Once you’ve scheduled your posts, you’ll get a notification on your phone that it’s time and the app will load your photo into Instagram and copy the caption to make posting super easy. Pro tip: Use the keyboard shortcut CONTROL + COMMAND + SPACE to open the emoji menu on your iMac or Macbook. Just because you’re using a computer to write your captions does not mean you have to miss out on all your favorite emojis! Pinterest is another one of our deep dark (well, really deep and citrus colored) obsessions, but it’s easy to waste a LOT of time there on a daily basis. Enter Tailwind, the best darn pin scheduling tool we’ve found to date. With their online interface, you’ll find the best times to pin for your audience each day. You can set as many or as few times as you’d like – we’re power pinners, so we typically go for 100-150 times each day. Then, using their browser extension, you’ll fill up your queue with major eye candy. Whenever it’s time for a scheduled post, their software will grab the next pin in your queue and post it directly to Pinterest. Pro tip: With their annual plans, you get unlimited pin scheduling each month, which means you can schedule literally thousands of Pins at a time to last you for months. To speed up your process, you can add several pins to the same board at once by repeatedly clicking the tailwind icon, then going into the app to update the board en masse, rather than choosing a board for each pin. Repeat with several boards, then use the shuffle tool to mix things ups! We’re not shy about using gorgeous stock photos on our social media (provided, OF COURSE, that we have the rights to use them! ), so when we do take an iPhone snap, we want to make sure it’s bright, airy and gorgeous as our professional pics. If you’re trying to get that clean, bright, white look, there’s nothing better than Pic Tap Go’s “lights on” filter – we’ll even use it twice to get the brightest possible photos. For more fine-tune adjustments, we also love Afterlight. Their suite of tools allow you to make more subtle adjustments, plus their fine control over any borders you may add allows us to match our iPhone borders to the Photoshop template we use on desktop. Perfect for every OCD creative! Pro tip: You can use each filter in Pic Tap Go multiple times, so if you’re trying to get that perfectly bright, white background, don’t be shy with it. Once you’ve gotten the level of brightness you’re looking for, you can use their other filters to restore some of the color and detail back into your image. We don’t hang out much on Facebook or Twitter, but if that’s where your ideal clients are, consider checking out Buffer. It’s the analog of Tailwind for other networks including Twitter, Facebook and LinkedIn, and can make managing such networks a breeze! One note – while they do have integrations with Pinterest, their tools are better suited for the light user, rather than a powerhouse pinner. 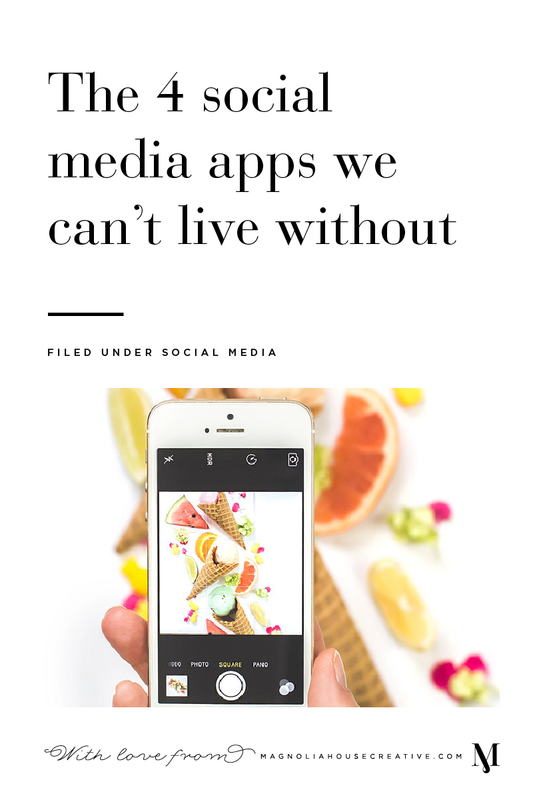 Do y’all use these (or any other) apps to maintain your social media accounts? Be sure to let us know in the comments!